The Argos website normally goes down along with the companies apps on iPhone, Android, and iPad during heavy traffic or you might see the Argos website running very slow at checkout. This popular UK shopping destination online is also one of the regular visits for shoppers offline, although millions pre-order products at the website before heading into stores to collect. When the Argos website is not working, or the app is down then it’s impossible to reserve to collect in-store or place orders to be delivered at home. These problems normally come with an error, which will state “we’ll be back soon” inside the app and at the website. There’s also other problems reported by UK shoppers, which include maintenance messages and sign in problems for your online account. The back soon message also states Argos is making your shopping experience better. On occasion, this could be an unplanned outage or the product database being updated. 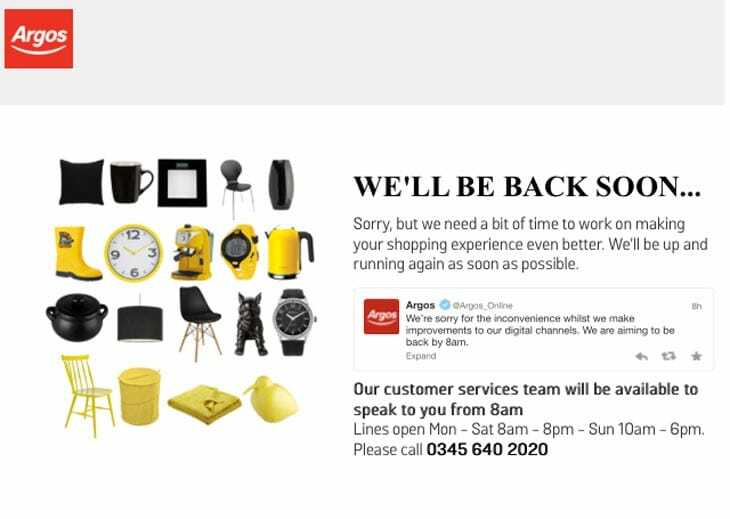 One new error that Argos has set up on their website this year, is when Argos website says “Sorry, we need a moment”, advising shoppers that demand is really high on the website at this particular moment. Is Argos down on Thursday April 25, 2019? If you see any problems with the apps or website, then leave a comment below with your nearest town if possible to spot issues by location. Been trying all afternoon and this evening to make an Argos Card payment. Payments declined no matter how I pay, Andriod, Laptop !! What’s going on Argos ? Fast track information is covering items I want to view !!! Absolute joke cannot put anything in the basket. Technical department get your finger out. Nothing being done what a joke cannot put anything in the trolley. I have an Argos card so I also have the app, which I use to pay off my card. However for the past week I canâ€™t log on to it to pay, and when I try to log in on the website it says the card does not exist….. how am I supposed to pay for the card if I canâ€™t do anything? The argos website has been faulty for the last 5 days and they dont seem to be doing anything about it. I have enquired at two stores and the staff dont know anything about it and were unaware that there is a problme. 1) There’s no “buy or resreve” button 2) the “Add to trolley button” doesnt work. These two things make it impossible to buy anything at the moment from the website. I can’t add more than one item to trolley, can’t check stock or log in. Not recognising our town on the map. We have two large stores locally so unable to reserve anything. can’t get into the website at the moment, anyone else having problems?? July 29/30 2017 click on add to trolley nothing happens, phoned argos they cannot help. waste of time. Access denied today to website. Kidderminster area. Not able to apply for Argos card apparently because I’m using a tablet, their calendar will not allow me to enter birth date but all other info it will accept.! Editor note: Argos website outage confirmed today, November 17. Site keeps saying “Sorry we need a moment”, so it looks like Black Friday is going to cause problems once again. All the links to 3 for 2 toys are broken with the standard message try being more specific with your search etc. In addition none of 3 for 2 splats are show against toys. Some toys list that they have a special offer however when you click on the item to see what the special offer is there is no info. They advertised that 3 for 2 would start today they should have had their tech prepared in advance and up by 00:00 on 4th Nov.
Can’t pay for home delivery fast track been trying g for a week now. Argos website is not loading again, September 20. Anyone else having problems in the UK? Problems with the Argos website down today on September 10. Hopefully this is just a temporary issue.. anyone else having issues? App down saying we can’t complete your request at this time. The Argos website has been down a lot of the bank holiday weekend, currently its completely down and the homepage just states this section isn’t available. Problems with Argos website and iPhone app. When go to purchase items says in stock for delivery so go to checkout and then they are out of stock!!!!!! The website has been down all day which means this is something serious, hopefully they’ve not been hacked. They are using crowd control today and the counter counts down to nought and still doesn’t let you into their website. Very annoying. Everything is really slow on the Argos website and it isn’t even Black Friday yet, I guess the servers are getting smashed due to the Argos 3 for 2 sale. Argos website is down on Oct 5, first time we seen in ages. I’m getting the message “Sorry our systems are temporarily unavailable”. Before this there was a countdown timer saying, “We are using crowd control”. Looks like this will be happening more during Black Friday and Christmas 2015 shopping online at Argos. I actually placed and paid for an item on 26th. I got no email or text message confirmation. I rang twice the following day, to be told that I would not get the item as the orders had been cancelled due to problems on their site. Now, the days later, still trying to get my money released. Argos reserved my funds, cancelled the account but haven’t informed my bank (who can’t return my money until argos authorise it). Not a small sum either, Â£99.99. Just so cavalier with other people’s money. Now they not answering phones!! The argos website is down with the error “Sorry, but we need a bit of time to work on making your shopping experience even better. We’ll be up and running again as soon as possible”. While I know it’s in the middle of the night, I wanted to do late night shopping online that’s meant to be 24/7. I guess they are keeping servers running well with maintenance during these busy sales events and of course getting ready for Black Friday deals. Guess the RED Friday Argos sale is causing them problems this weekend, imagine what the website could be like during real Black Friday sales next month? They wont load the delivery spots i want it delivered today and it keeps saying sorry, cant load delivery spots please try again later to which i have done..
Argos has the worst website and app in the world. It’s always down and advertises discontinued products. What a big shame! A big company like Argos. Really disappointed. problems loading argos website, keep getting a down message loading. They are upgrading and improving both the apps and website at the same time. Shame it’s down, as I wont be able to order anything at 8am, as will be driving. Hopefully it comes back up on time. Just opened the argos website on my iPhone 6, seeing it’s down and will come back at 8am.